Call (716) 249-3874 for an exploratory look at the past, present, and future of the Richardson Olmsted Campus! Learn more about the history of our 145-year-old National Historic Landmark! One of Buffalo’s most iconic buildings and a National Historic Landmark, the 145-year-old Richardson Olmsted Campus is being renewed after years of neglect. 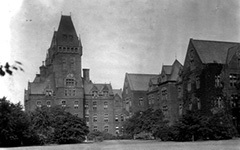 Designed by great American architect Henry Hobson Richardson and the famed landscape team of Frederick Law Olmsted and Calvert Vaux, the building incorporated a system of enlightened treatment for people with mental illness developed by Dr. Thomas Story Kirkbride. 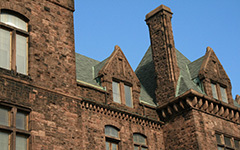 Today, the Richardson Olmsted Campus is home to one of the largest historic preservation projects in the nation. Since 2006, the nonprofit Richardson has been hard at work bringing the site back to life after decades of neglect. The Richardson Olmsted Campus is now accepting applications for a Tours and Programming season. Help shape the Richardson Olmsted Campus' future! Share your opinion about the Richardson Olmsted Campus via a branding survey.